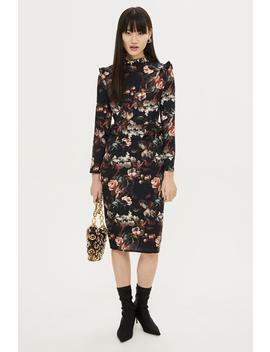 Add some autumn winter sophistication with this floral midi dress with high neck ruffle. 100% Polyester. Machine wash.**PLEASE NOTE THIS ITEM CAN ONLY BE RETURNED VIA POST. STORES ARE UNABLE TO RETURN THESE ITEMS FOR YOU. ALL UK POSTAL RETURNS ARE FREE. INTERNATIONAL POSTAL CHARGES WILL VARY.